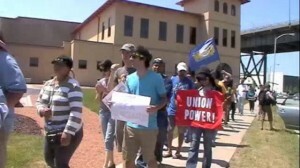 Click photo of striking workers to hear why they continue to be on strike against Palermo's Pizza. Palermo’s workers have now been out on strike for more than three weeks because strikers say management refuses to recognize their newly formed union, Palermo’s Workers Union, as a legitimate bargaining unit. In the video embedded in this story, Orlando Sosa discusses the hardships of being on strike but why he remains on the picket line and how he feels about the continued reaction of management to the union organizing efforts. Also in the video, Gerry Miller of United Steel Workers local 1343 discusses why he supports the Palermo’s strike. Palermo’s workers continue their strike with growing support from elected officials, community groups and labor unions. Milwaukee City Assembly members Marc Pocan (78th Assembly District) and Jocasta Zamarripa (8th Assembly District) are both publicly supporting the union organizing efforts of Palermo’s workers. Community groups include Nuns on the Bus, who made a visit Wednesday to the picket line to show support; Occupy Milwaukee; Occupy Riverwest; the Overpass Light Brigade; Voces de la Frontera and the Riverwest Co-op has officially boycotted carrying Palermo’s products. Other supporting unions include AFT local 2169, Ironworkers local 8 and Industrial Workers of the World Industrial Union Branch 560. MN Occupy Wall Street: "Don't Foreclose on the American Dream"
The day after Wisconsin Governor Scott Walker survived his recall election, hundreds of activists marched in the streets of Milwaukee in non-violent civil disobedience from Pere Marquette Park to City Hall and into the banking district. A national boycott of a pizza company that's refusing to bargain with a newly formed union is gaining traction as groups target Costco which carries the pizzas.